If you’re running Windows 10 on your computer or laptop and feeling very irritated because of its sluggish performance? Don’t worry! In this article, you will check out some useful tricks and workarounds that will definitely help you to fix slow running Windows 10 PC and will boost overall speed of your system. After making the following changes on your Windows 10 PC, you will notice the change and enjoy the speed of your owned PC running Windows 10 into it. So without further delay, why don’t you start checking these tips to fix slow running windows 10. Improvisation, making things more interesting and attractive lead to more energy consumption. Here, Windows has improved a lot in terms of attractiveness then simultaneously, it uses more power, extra RAM space and slows down the functionality. Follow below the mentioned steps to disable the animations and effects to improve the performance of your PC. 1. Launch RUN dialog box using WIN + R keyboard shortcut. Type sysdm.cpl and click OK.
2. System properties window will pop up. Here switch to Advanced tab, and then click on the Settings button which you can see under Performance section. 3. In this window, click on Custom radio button and uncheck all the settings except the second one “Animate windows when minimizing and maximizing” (shown in the following image). Click on Apply button to make changes. Did you know there are many unnecessary programs which start up with windows and slow down the system performance? Yes, there are such programs but no need to worry about it as they can be disabled. Disabling such programs is a very easy task with the below steps. 1. Open Task Manager by right-clicking on the Start button and from the options click on Task Manager to launch it. 2. Click on Startup tab and choose unwanted startup programs from the list and hit disable button to disable these startup programs. You will definitely notice the change in the processing speed of your Windows 10 PC. You will find this idea very useful and fruitful when once you try this on your system. With my experience, I would advise you to follow this step which will lead to speed up the processing of files and folders. 1. 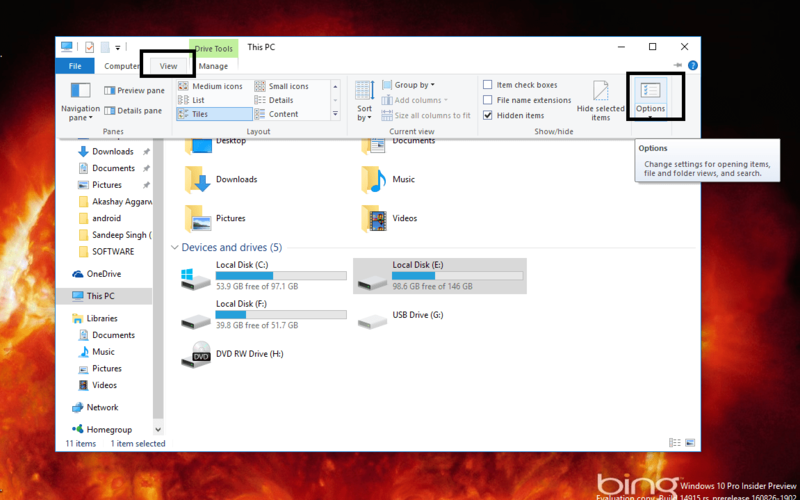 Launch the File Explorer -> This PC and click on the “View” tab which you will find in Ribbon. 2. It will launch the Folder Options window. Here you need to click on the Options which is listed at the end. Alternatively, you can also search Folder Options in the Start menu search bar and when you see it in search click to launch it quickly. Display file size information in folder tips. Hide extensions for known file types. Show encrypted or compressed NTFS files in color. 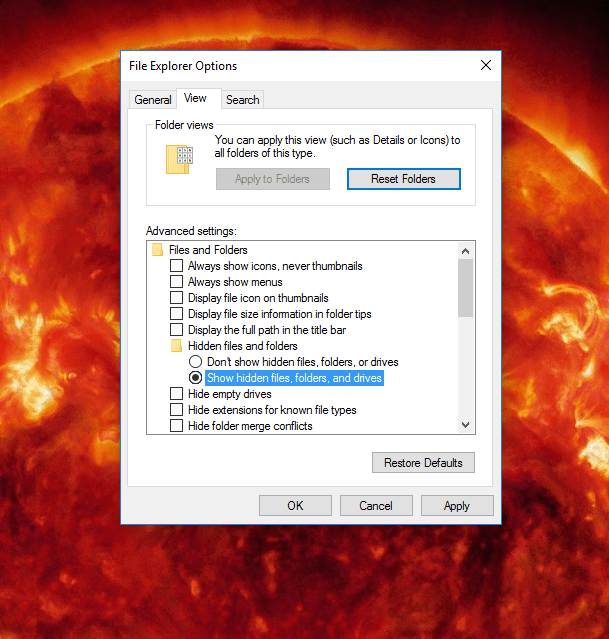 Show pop-up description for folder and desktop items. 4. Once done, click on Apply button and then OK.
1. Launch the Settings apps from the Start Menu of Windows 10. Or you can press WIN + I shortcut keys to quickly launch the Settings app window. On the right pane, look for “Make Start, taskbar, and action center transparent” this setting and turn it off. This is one of the useful information which every Windows 10 users must know. The operating system also uses some part of system hard drive to keep the performance balance. In this case, the system memory will burst out, which in return cause issues. So it is highly advisable to maintain least ten percent of the total space free to maintain the performance. So, remove data which is not required, make a backup of movies, photos, and videos on an external drive. 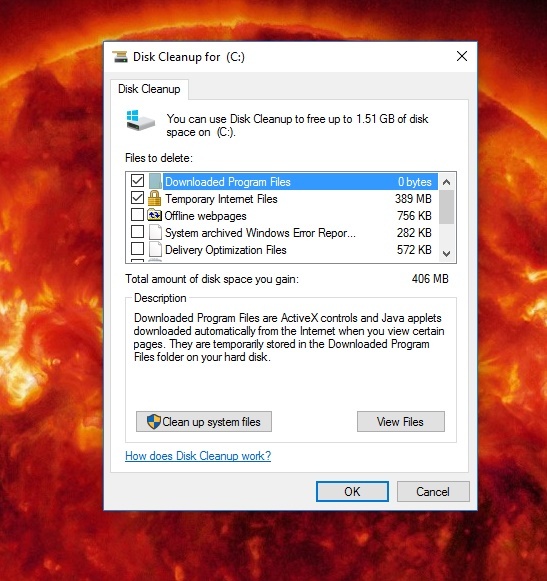 To remove temporary and other unnecessary files, make a habit of using Disk Cleanup utility. Search for Disk Cleanup from the Start Menu. 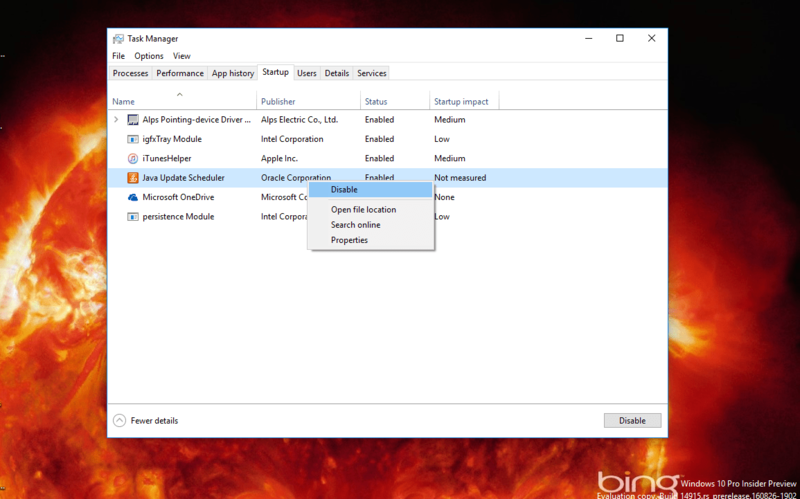 Click on the Disk Cleanup utility in search results to launch it. Click OK and it will start calculating how much space you can free. Another window will come up. Here you need to click OK. In case, you want to see some advanced options, then you can click on “Clean Up System files” button -> Select the files which you want to clear and click OK.
We have the solution to fix such issue by using external RAM modules and Hard Drives. This solution can give your system another few years of life. However, we suggest you to upgrade the system hardware time to time as well. To find out your system information. You can simply search “System information” and when the same option appears in the search result click to launch it. Under System summary, you will find out all the details about your system. Also, you will get an idea what hardware is outdated. RAM: 1 gigabyte (GB) for 32-bit or 2 GB for 64-bit OS. I love the notification sound of my laptop when it reminds me the low battery power but I do not like it much when it is not required such as while plugging or unplugging the pen drive. You can disable the all or some of these sound notifications. 1. In the Start menu search bar, type Sounds and from the search results click on “Change system sound” to open it. 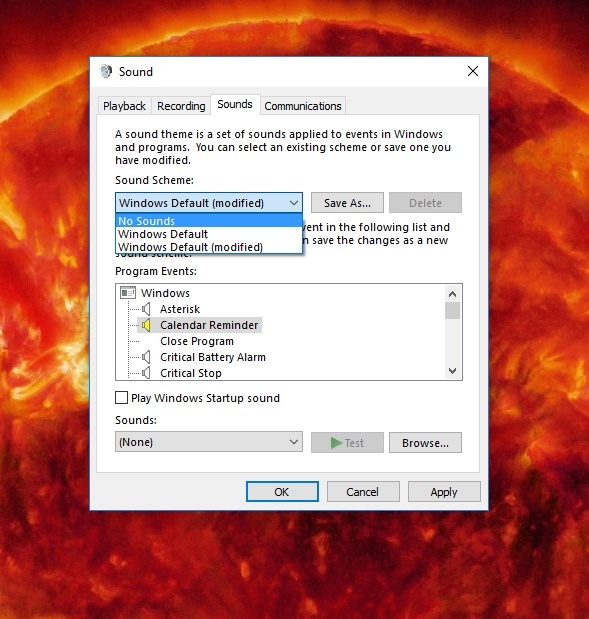 Alternatively, Make a right click on the Sound icon in the notification area at the bottom-right side of the screen and from the options click on Sounds to launch the system sounds setting window. 2. In the Sound window, choose None from sounds dropdown list after selecting the desired program which you want to disable. In case, you wish to disable the sounds from all notification then you can also choose No Sounds from Sound Scheme. You must be aware of the applications installed in your system because, in Windows 10, there are some pre-installed modern apps which keep itself running in the background and hit your system performance. Find few options which can help you in uninstalling the apps. To make your PC friendlier to you, Operating System collects information regarding you at the backend such as your typing behavior, account information, credentials. But this is also true that the whole process also affects overall system performance. 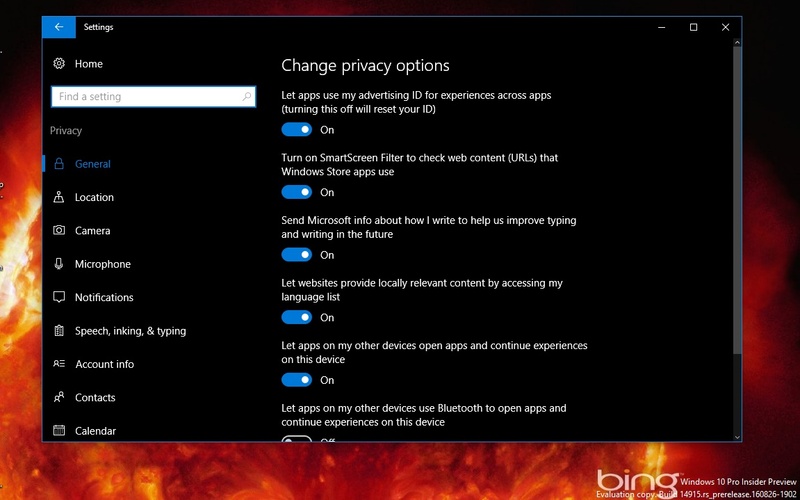 You can configure the privacy settings in Windows 10 which improves the performance of your system. Launch the Settings apps -> Privacy. 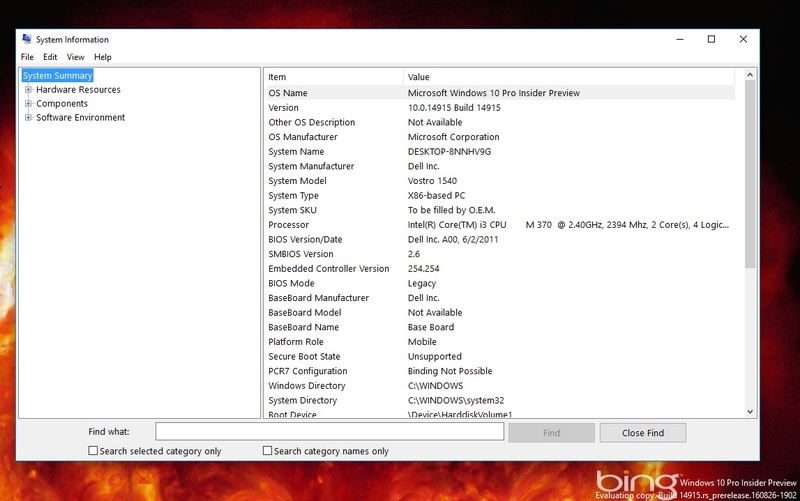 Here you will find privacy settings for all the components of the Windows 10 operating system. It is up to you which privacy settings you want to disable. Always install the useful and necessary apps and software. Also, uninstall the one which is of no use. Always use a good antivirus and update it time to time. So these are some of the tips which you can follow to fix slow running windows 10 PC. Why don’t you give a try to these tips and let us know which you find useful?